Drugs run the gamut from being helpful and lifesaving to being nothing but deadly. What all drugs have in common, however, is that they can be incredibly dangerous when left unattended. Disposing of unused drugs is not simply a matter of throwing them away or flushing them down a toilet. Whether it’s expired medication or used needles, controlled substances should be discarded properly and carefully. As many as 2.8 million pills go unused in the United States every year. Instead of being properly attended to, they are often left forgotten in medicine cabinets, waiting to be picked up by a child, a teenager, or even an adult. When it comes to needles (which are usually given to clients who receive their treatment in an outpatient setting, such as for diabetics), the best time to appropriately dispose of them is immediately after they have been used. 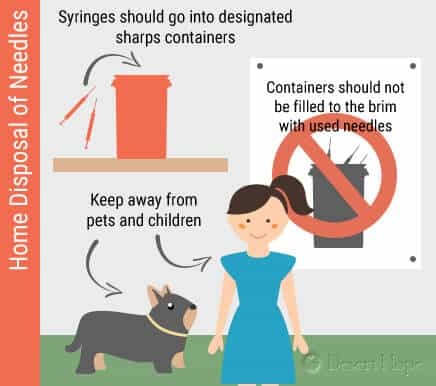 Syringes should go into designated sharps containers the moment the medication has been administered; doing so cuts down on the risk of cuts and punctures. Disposal containers themselves should be kept away from pets and children. As for how to get rid of the containers, different cities, states, and counties have their own laws. Local health and municipal departments provide information on the safe disposal of sharps and their containers. Some communities also have supervised collection sites, which are usually found in hospitals, pharmacies, certain public restrooms (such as those in public libraries), police and fire stations, and medical waste facilities. Using some of these collection sites is free, but there may be a small fee for others. Public household hazardous waste collection sites, like those that accept everyday chemical materials like motor oil, paints, and household cleaners, may also take medical waste like used needles. Specific sharp containers that have been cleared by the FDA can be mailed to a collection site, instead of physically dropping the containers off, if the mailing and shipping follows FDA guidelines. This normally costs a fee, which is based on the size of the container and the nature of the medication that the needles were used to administer. Finally, for people who may not be able to make the journey to a collection site, local city or county authorities may send trained, special waste handlers to collect needle disposal containers from their private residences. There are usually strict requirements for what types of containers will be picked up in this way, as well as other considerations (such as if the house visits are carried out regularly or only if the patient calls to schedule a pick up). Medications that come in tablet form aren’t as instantly hazardous as needles, but they are no less dangerous. Extra pills should not be thrown in the trash, and they should definitely not be given to other people. The JAMA Psychiatry journal attributes this behavior to being a significant contributor to tens of thousands of people becoming addicted to powerful and deadly drugs, and creating a black market for the opioid epidemic that has swept across America. Primarily for that reason, the federal government authorized pharmacies and clinics to receive their clients’ unused prescription drugs, depriving drug smugglers the material that fuels their trade and reducing the chances that people who shouldn’t be taking medication off label are being given that opportunity. The Wall Street Journal reports that the Drug Enforcement Administration reversed its policies on pharmacies taking back painkiller prescriptions, which used to be forbidden under previous rules regarding the disposal of controlled substances. Clients had to get rid of their pills down the toilet or in the trash, but environmentalists complained that such methods could disrupt the biology and behavior of fish and other aquatic wildlife, even if the drugs are broken down and diluted into microscopic amounts. The Journal of the American Osteopathic Association also notes that many municipal sewage treatment plants are not capable of extracting pharmaceutical material from wastewater, so there is very little to prevent controlled substances from contaminating the environment if they are flushed down toilets or garbage disposals. The discoveries are a notable reversal from a few years ago when scientists argued that common disposal methods for unused drugs were no worse than drug take-back programs. In 2012, the Environmental Protection Agency reported that there was no evidence that drugs in the environment would have harmful effects on humans, and researchers writing in the Environmental Science & Technology journal claimed that the burning of drugs (which is how take-back programs typically destroy the substances) does more damage to the environment (due to greenhouse gas emissions) than simply throwing them in the trash. However, other environmental research has pointed out that the toxicological damage caused by pharmaceuticals mixing with wastewater and fish is worth investing in take-back programs. The ruling by the Drug Enforcement Administration would also allow people to mail in their unused pills. Once clinics and pharmacies have accounted for the medications, the substances would be destroyed. Other versions of the program have proven popular. In April 2014, as part of a “Take Back Day” organized by the National Prescription Drug Take-Back Initiative program, the DEA collected 390 tons of prescription medications at over 6,000 sites across the country. The record was set in 2016 when the DEA collected more unused prescription medications than in any year since the program started in 2010; a total of 893,498 pounds (almost 447 tons) was claimed at almost 5,400 sites in every state across the country. Residents of Texas contributed almost 40 tons alone; the next highest was California with 32 tons. On college campuses, where germs spread like wildfire and stressed-out students are prescribed drugs that can easily be abused, drop-off boxes make drug disposal “safer and easier than ever.” In spring 2016, the boxes at the University of Utah had accumulated nearly 500 pounds’ worth of leftover pills and bottles, everything from expired and unused medication to no-questions-asked controlled substances. The success of the program comes as a relief to health officials in the state; Utah ranks fourth highest in the country for drug overdose deaths, and more than 20 residents die every month from excessive prescription painkiller consumption. Other developments have made it possible for even the most potent of medications to be disposed of quickly, easily, and without having to leave the house. One such innovation is a drug deactivation pouch; a kit can hold up to 45 pills and combines the pills with carbon in the lining and water to chemically deactivate the prescription opioids. The process takes a half-hour, after which time the pouch can be thrown away in an ordinary trash bag, leaving no danger of environmental contamination. Even consuming the drugs in the pouch after they have been treated in this way will not cause any harmful health effects. The pouches provide parents with a quick, safe, and free way to ensure that curious children and impulsive teenagers are not exposed to addictive medication. The deactivation pouches have proven so useful that Mallinckrodt Pharmaceuticals, a national company, donated 60,000 of them across Southern Nevada. Through a partnership with Roseman University of Health Sciences, Mallinckrodt will also hand out the pouches at health fairs and drug abuse education events. Mallinckrodt’s gesture comes at a time when Nevada is suffering “an unacceptably high number of drug deaths” – 382 such fatalities in 2015. The number is actually down from 2011 when there were 531 reported overdose deaths. State officials and healthcare experts are unsure as to how the mortality rate is declining, but they are hoping that the drug deactivation pouches will ensure there is no bounce in the statistics. If the pouches are used as they should, approximately 2.7 million pills in southern Nevada could be neutralized. The senior director of state government affairs and advocacy for Mallinckrodt said in a statement that the need for drug disposal pouches (and their popularity) highlights the danger of leftover pills. Many people think nothing of helping themselves to the extras they find in a home medicine cabinet, whether to help their own aches and pains because they’re not feeling well or simply because they’re curious. Seeing pills in such a domestic and mundane setting disguises the fact that they are complicated and powerful chemicals, interacting with human biology and psychology in unpredictable and dangerous ways. 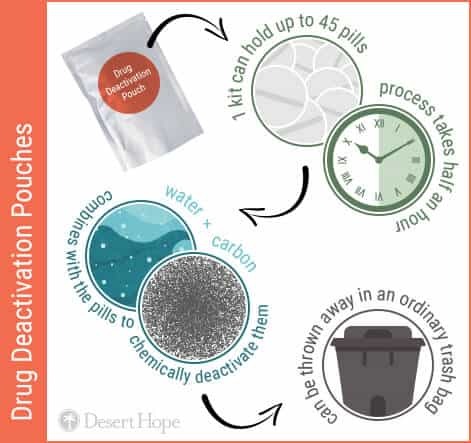 Having a drug deactivation pouch in the home reinforces the idea that extra pills should not be shared or consumed, but disposed of. Nevada is not the only state to benefit from Mallinckrodt’s donations. In October 2016, the company gave away 160,000 of its deactivation pouches to families and nearly 800 Walmart stores in Tennessee, Indiana, Ohio, South Carolina, Pennsylvania, Kentucky, and West Virginia. The Central Appalachian region of the United States has been one of the hardest hit by the opioid epidemic, and Mallinckrodt hopes that the ease of use of the pouches will encourage people to safely and responsibly get rid of their excess medication. If every one of the 160,000 pouches is used to capacity, it’s possible that 7.2 million prescription tablets could be properly destroyed. In New England, where quaint rural towns have been devastated by heroin and opioid use, pharmacies in Connecticut have received 80,000 deactivation kits from Mallinckrodt, and customers can pick them up for free. The governor, lieutenant governor, attorney general, and consumer protection commissioner of the state all welcomed Mallinckrodt’s “critical” contribution to the fight against prescription opioid abuse. If a needle needs to be disposed of immediately, public health inspectors recommend picking up the needle with tongs or pliers (while wearing gloves) and then depositing it needle-side down into bottles or other solid, durable containers. The containers themselves should still be turned over to a collection site, police officer, or appropriate city employee as soon as possible, and it should not be disposed of manually. It may also be advisable to properly dispose of the tongs or pliers as well. Other side effects of the opioid crisis are discarded needles. In Boston, local authorities discovered thousands of used needles that heroin addicts left in public places, like portable toilets and bus stops. Across the country, city employees in Sacramento retrieve an average 50-60 syringes every day, from parks where adults, children, and pets run freely. The risk is not just limited to trace amounts of heroin still in the syringes; drug users who are positive for HIV or viral hepatitis can transmit their infections via blood or other bodily fluids through sharing used needles or leaving exposed needles that can be stepped or sat on. The journal of Paediatrics & Child Health recommends education for both parents and children on what to do if a discarded needle is found in a public location. In Seattle, for example, citizens are urged to not pick up found needles but to instead call the Seattle Parks Department or Seattle Public Utilities. Local government has hired a “cleanup program manager” who is paid up to $39 an hour to “handle toxic/hazardous substances” and is responsible for responding to reports of discarded needles. The extent of the needle problem is such that clinics and local governments are looking into the idea of facilitating syringe exchange programs, where drug users are encouraged to trade their used and dirty needles for clean ones. Not only do they get safe needles to use, they are also provided with on-the-spot counseling, education about substance abuse and mental health, and conversation with onsite social workers and healthcare professionals as a way of gently steering these addicts toward treatment. The drug abuse is also closely monitored; the staff are prepared to intervene if a user is at the risk of overdosing. There is also a financial consideration behind syringe swap programs. It costs hospitals around $11.4 million a year to treat drug addicts who have bacterial infections from sharing dirty needles. Providing users with clean needles drastically cuts down on the chances of them contracting HIV, hepatitis, or other blood-borne conditions from other users. Needle exchange programs have proven controversial. Local politicians and members of the general public are leery of creating a space where drug users are allowed to continue their habit, but advocates counter that this is the only way to make a connection with chronic addicts. Supporters also point out that by encouraging drug users to trade their needles in, there is less of a chance of those needles being abandoned in public places. As the Los Angeles Times put it, “If drug use can’t be halted, at least harm can be reduced.” Furthermore, replacing dirty needles with clean needles not only reduces the risk of disease and infection for drug users, it also reduces the risk of disease and infection for members of the public who may come into contact with those needles. In New Jersey, early signs indicate that a pilot program was successful in not only keeping needles off the streets, but also in getting users into long-term treatment. The success of such programs in safely disposing of used needles has been noticed in other parts of the country. The experiment in Wayne County, Michigan, resulted in five users returning 244 used needles; in Fayette County, new clients are coming to the program, “with a couple asking for treatment.” Program operators in both counties told local news that their respective goals are being met. State records show that the opioid population in Fayette County has dropped by 22 percent since the needle exchange program opened its doors. As much as this means that there are fewer people overdosing to death on heroin and other narcotics, it also suggests that there is less needle use taking place in Fayette County, and that there are fewer contaminated and discarded sharps lying on park benches and bus stops. Even in Texas, a state notorious for its decades of zero tolerance towards drug use, the calls are growing ever louder for the Lone Star State to adopt needle exchange programs as a way of “[saving] lives in Texas” – both those of drug users, and of people who could step on a discarded sharp in a park and come away positive for HIV. Indeed, the Harm Reduction Journal wrote that the presence of syringe exchange programs in cities lowered the number of contaminated needles in respective communities. In Baltimore, for example, there was a “significant decline in the overall quantity of discarded needles,” after the introduction of such programs. Other studies have also shown that communities are safer when needle access facilities allow for the safe disposal of dirty needles. In Portland, Oregon, for example, the opening of a site was helpful in lowering the number of abandoned needles by almost 66 percent. The American Foundation for AIDS Research makes the claim that needle exchange programs protect not only the general public, but also police officers and other public health and safety workers who will be exposed to a significantly reduced number of contaminated needles to pick up. This is also the opinion of a retired New Jersey deputy fire chief and president of the New Jersey Deputy Fire Chiefs Association who said that firefighters “who crawl on their hands and knees through smoke filled rooms” are much safer from needle sticks in cities where addicts can go to needle exchange sites. Similarly, a former captain in the sheriff’s office of Macon County, North Carolina said that there is a direct connection between needles being taken off the street, and the safety of police officers; needle stick injury to local cops has dropped by 66 percent. The foundation calls needle access programs a “cornerstone of prevention efforts” to protect everyone – drug users, first responders, sanitation workers, and members of the public – from the effects of coming into contact with exposed, contaminated needles. Such programs, as well as drug deactivation pouches and educational outreach to communities, could deal a significant blow to exposure to dangerous, and potentially deadly, drugs. “Green Pharmacy and PharmEcovigilance: Prescribing and the Planet.” (March 2011). Expert Review of Clinical Pharmacology. Accessed December 21, 2016. “Patient Practices and Beliefs Concerning Disposal of Medications.” (November-December 2006). Journal of the American Board of Family Medicine. Accessed December 21, 2016. “Educate Patients About Proper Disposal of Unused Rx Medications—For Their Safety.” (April 2015). Current Psychiatry. Accessed December 21, 2016. “Safe Disposal of Unused Controlled Substances.” (n.d.) Avalere. Accessed December 22, 2016. “Best Way to Get Rid of Used Needles and Other Sharps.” (July 2015). Food & Drug Administration. Accessed December 20, 2016. 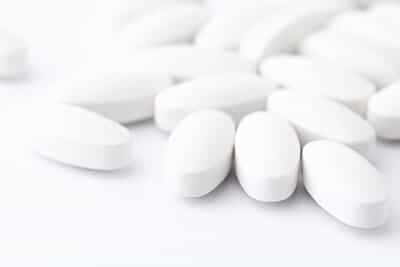 “By Sharing Painkillers, Friends and Family Members Can Fuel Opioid Epidemic: Study.” (June 2016). Kaiser Health News. Accessed December 20, 2016. “U.S. to Allow Pharmacies to Take Back Unused Prescription Drugs.” (September 2014). Wall Street Journal. Accessed December 20, 2016. “Can You Flush Your Old Drugs Down the Toilet?” (July/August 2012). Mother Jones. Accessed December 20, 2016. “Current Regulations and Modest Proposals Regarding Disposal of Unused Opioids And Other Controlled Substances.” (July 2008). Journal of the American Osteopathic Association. Accessed December 21, 2016. “Study: Trash Old, Unused Drugs.” (May 2012). Web MD. Accessed December 22, 2016. “Drugs in the Environment: Do Pharmaceutical Take-Back Programs Make a Difference?” (May 2010). Environmental Health Perspectives. Accessed December 22, 2016. “DEA Collects Record-Setting Amount of Meds at Latest National Rx Take-Back Day.” (May 2016). U.S. Drug Enforcement Administration. Accessed December 21, 2016. “Proper Drug Disposal Safer and Easier than Ever.” (April 2016). University of Utah Health Care. Accessed December 21, 2016. “Drug Deactivation Pouches: New Weapon in War against Drugs.” (October 2016). SILive.com. Accessed December 22, 2016. “Pouches Aim to Take Leftover Prescription Drugs out of Valley Homes.” (December 2016). Las Vegas Sun. Accessed December 22, 2016. “Pouches Available for Southern Nevada Residents to Dispose of Prescription Drugs.” (December 2016). Las Vegas Review-Journal. Accessed December 21, 2016. “Mallinckrodt Pharmaceuticals Donates Drug Deactivation Pouches to Enable Safe Disposal of Prescription Drugs in Tennessee.” (October 2016). PR Newswire. Accessed December 21, 2016. “Drug Deactivation Kits Now Free at Pharmacies.” (December 2016). CT Post. Accessed December 22, 2016. “Drug Addicts Leave Parks Stuck with Discarded Needles.” (September 2016). Sacramento Bee. Accessed December 20, 2016. “Why Does Heroin Use Create Special Risk for Contracting HIV/AIDS and Hepatitis B and C?” (November 2014). National Institute on Drug Abuse. Accessed December 20, 2016. “Needle Stick Injuries in the Community.” (March 2008). Paediatrics & Child Health. Accessed December 22, 2016. “Don’t Touch: What to Do When Finding Needles in Seattle.” (February 2016). KIRO7. Accessed December 20, 2016. 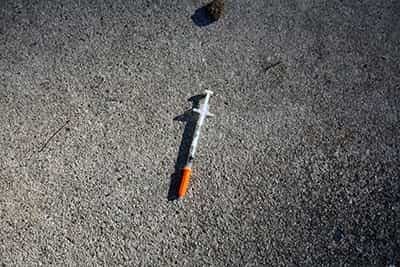 “Discarded Drug Needles Being Found in Arlington Shopping Centers, Parks.” (March 2015). Q13 Fox. Accessed December 20, 2016. “What To Do if You Find a Discarded Needle and How to Remove It.” (April 2015). CBC News. Accessed December 21, 2016. “Rare Glimpse at How Needle Swap Works.” (December 2016). The Journal Gazette. Accessed December 21, 2016. “This Clinic Trades Used Needles for New Ones in a First-of-its Kind Program.” (November 2016). Miami Herald. Accessed December 22, 2016. “County Gets Its First Needle Exchange Program.” (February 2016). Los Angeles Times. Accessed December 22, 2016. “Needle Exchange Pilot Programs in NJ Are Successful, Health Department Finds.” (April 2010). NJ.com. Accessed December 22, 2016. “Needle Exchange ‘Goal Is Being Reached.’ “ (December 2016). Pal-Item. Accessed December 22, 2016. “Commentary: Syringe Service Programs Could Save Lives in Texas.” (December 2016). Austin-American Statesman. Accessed December 22, 2016. “Bundling Occupational Safety with Harm Reduction Information as a Feasible Method for Improving Police Receptiveness to Syringe Access Programs: Evidence from Three U.S. Cities.” (July 2009). Harm Reduction Journal. Accessed December 22, 2016. “The Effect of a Needle Exchange Program on Numbers of Discarded Needles: A 2-year Follow-up.” (June 2000). American Journal of Public Health. Accessed December 22, 2016. “Impact of a Needle Exchange Program on Potentially Infectious Syringes in Public Places.” (May 1992). Journal of Acquired Immune Deficiency Syndromes. Accessed December 22, 2016. “Syringe Services Programs.” (May 2016). Centers for Disease Control. Accessed December 22, 2016. “Needle Exchange Programs Promote Public Safety.” (n.d.) American Civil Liberties Union. Accessed December 22, 2016. “Public Safety, Law Enforcement, and Syringe Exchange.” (May 2011). American Foundation for AIDS Research. Accessed December 22, 2016.